Should software be clean, simple and stripped back? Or should it be feature-packed, so users aren’t left wanting? This is the tricky line Android phone makers have to tread. Google, which develops the Android operating system and licences it out to third-parties like Huawei, typically plays the conservative. Samsung Galaxy owners are often baffled when they hear a feature their phone had years ago has finally made it to Android proper. There’s a good reason for that. It’s taken a long time for Android to reach the level of cohesion required to make it a real alternative to Apple’s iOS in terms of slick performance. Google’s Material Design guidelines, which third-parties are encouraged to use, are designed so that each app has a consistent layout, look and feel. When the likes of Samsung don't follow those guidelines, the user experience is affected (in Google's eyes). It’s common for Android phones to be praised for the features they pack in, but critiqued for how they’re implemented - historically Android phones have been stuffed full of extra, which is where the idea for Android One came from. Similar to the stock version of Android that Google uses on its Pixel devices, Android One promises to be both a streamlined, bloat free version of the operating system, as well the most secure thanks to regular security updates. But do those benefits outweigh the loss of features and customisation that go hand-in-hand with custom interfaces? Google releases monthly security updates for Android. If you have an older, non first-party Android phone, you might not get them. Or at least, not as quickly. Security updates on non-Pixel or Android One devices are often delayed by months as they roll through testing, which isn’t ideal at a time when taking care of personal data is a top priority. Google’s “Project Treble” has gone some way towards streamlining security updates by separating the Android OS code from vendor specific (e.g Samsung) hardware code. This allows device manufacturers and networks (which still insist on adding in their own wacky apps to Android) to focus on updating their custom skins and OEM apps, rather than the underlying update code. The Google Pixel 3 is one of the most secure Android phones around. Project Treble has made updates smoother, but there’s still a layer of customisation and carrier approval to work though. Android One phones are much more like Pixel devices, marking a closer collaboration between Google and a phone-maker. There are no fancy skins or OEM apps to update, since Android One uses the stock Android interface. Device makers still need to update apps they’ve tweaked, but updates are much quicker to arrive. Android One also one guarantees a certain level of security maintenance. “Monthly security updates [are] to be supported for at least three years after initial phone release,” according to Google, which is a vast improvement over many Android phones. Monthly security updates help protect your phone from the vulnerabilities that arise as hackers devise ever more intricate ways to steal your data. This doesn’t mean you can sideload any app you like and tap on weird links texted to you without risking malware, though. Using Android One means you’re as secure as a Pixel phone, without having to pay the Pixel’s ever-increasing price tag. Similarly, Android One phones receive full OS updates in a more timely fashion. 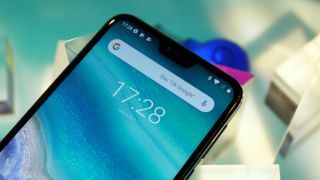 While not necessarily on day one of release like Pixel devices, Android One phones like the Nokia 7.1 and Motorola Moto One should, in theory, receive updates quicker than alternatives thanks to using a stock Android interface that requires little customisation. When a new version of Android arrives, manufacturers have to make it work with their customisations. In software development, when one thing changes, another thing usually breaks. EMUI updates don't typically arrive quickly thanks to Huawei's extensive Android customisations. Android One phones have largely stock software, although they are allowed slight tweaks that add to, rather than fundamentally change, the system. For example, the Moto One has Active Display, which makes a clock and notifications display pop up when you pick the phone up while in standby, as well as shortcut gestures. Motorola needs to make sure these bits still work before sending any Android updates over the airwaves. Other brands that customise the interface, on the other hand, needs to test and tweak entire interfaces before releasing it. Some custom Android interfaces might put extra strain on a phone’s processor and RAM if they're not properly optimized. Ever noticed jittery scrolling even when using a powerful flagship phone? That’s poor software optimization at work. It gets worse with entry-level phones, which don’t have a great deal of processing power or memory to drive bloated custom interfaces. Since Google has 'baked in' much of the heavy lifting with Android One, theoretically you get a smooth, reliable experience, even with low-end hardware. If you’re looking for an ultra-affordable phone, it’s also worth considering Android Go. This is a cut-down version of Android optimised for phones with extremely limited RAM and storage. Android One is designed with cohesive look and feel that makes for a intuitive experience. Google doesn’t always get it right, of course, but compared to some of the more onerous user interfaces in the past, it’s a vast improvement. Android P has a clean and cohesive user interface. Google’s Material Design guidelines favour a clean, stark look with little in the way of superfluous visual flourishes. There are no conflicting design elements and no need to look through an app for a theme you like (Android One doesn’t even support themes by default. Wallpapers are the main way to alter the look to your liking). Not used a stock Android phone before? Android One has an opaque apps page, arranged as a single vertical scroll. App icons are round and the overall look is very neutral. It’s friendly but not cutesy, making it almost impossible to be offended by the look of Android, though naturally such things are a matter of taste. Android One phones don’t come with many unwanted preinstalled apps, commonly called bloatware. There are no installs from third-party developers like Amazon or Gameloft, which are often sneaked on as the app equivalent of an advert. However, extra apps aren’t banned entirely. The Nokia offers a custom camera app and “help” apps on the 7.1. The Motorola Moto One has its own camera app too, as well as a Moto app that lets you customise Motorola’s added features. You get the neat parts of manufacturer customisation, without the superfluous parts loaded on top. The rest is simply Google’s own app suite. Android One guarantees not just three years of security updates, but two years of operating system updates too. This effectively means that you get two major functionality upgrades from the point at which the phone was originally released. Notably, that time period is not from the time you purchase the phone, which is something to bear in mind if you’re seeking out a bargain towards the end of a phone’s shelf life. Android One phones will get Android 9 Pie and whatever comes after that (best guesses on a postcard). Android naming convention suggests it’ll be something sweet beginning with Q: quince jam, quottab, quindim? It all gets a bit niche once when you have to start with a Q.